Church of Scotland in Forgue. Forgue, a parish on the north-western bordon of Aberdeenshire. The church, near which a hamlet once existed, is situated 5 1/2 miles E of Rothiemay station, and 7 1/2 N E of Huntly, under which there is a post office, with money order and savings bank departments. The parish is bounded N and N E by Inverkeithny in Banffshire, E by Auchterless, S by Culsalmond and Insch, W by Drumblade and Huntly, and N W by Rothiemay in Banffshire. Its utmost length, from N to S, is 7 5/8 miles; its breadth from E to W varies between 2 and 3/8 miles; and its area is 17,379 1/2 acres, of which 25 1/2 are water. The river DEVERON winds 9 furlongs along the Rothiemay border; Glen Water or the URY, flowing 2 5/8 miles eastward through the Glen of Foundland, traces all the southern boundary; the YTHAN, rises in the southern interior, and passes off into Auchterless; whilst Forgue and Frendraught Burns, uniting below the church, carry most of the drawings northward to the Deveron. The surface declines along the Deveron to 242 feet above sea-level, at the confluence of Forgue and Frendraught Burns to 232 feet along the Ury to 538, and along Ythan to 508; and the interior is a fine alternative of vales and hillocks, holms and knolls. The north-western extremity is occupied by part of FOREMAN Hill (1127 feet); and in the S rise Broom Hill (1006), Wether Hill (943), and the Hill of Bainshole (1042). The chief rocks are greywacke, clay, slate, limestone, granite gneiss, and syenitic greenstone, of which the slate and limestone were formerly quarried at Lamhill and Pitfancy. The soils are various -- sandy, gravelly, loamy, clayey, and mossy; some rich and grateful, others poor and barren; some yielding from eight to ten returns of seed sown, others returning no more than two or less than three. Much of the land incapable of being turned to any better account is covered with plantations. An interesting ruin, famous in ballad and separately noticed is Frendraught Castle; other antiquities are remains of several ancient Caledonian stone circles, and of is conjectured to have been a Roman redoubt. The Admirable Critchton (1560-83) has been claimed as a native, falsely, since ELLOCK, in Dumfriesshire, was his birthplace; but in Forgue was born the eminent antiquary, John Stuart, L.L.D. (1813-77). A large distillery is at Glendronach, and friars are held at Hawkhill. In 1875 a neat cottage hospital was built in this parish by Mrs. Morison of Bognie, for patients residents in the parishes of Forgue, Ythan-Wells, Auchterless and Inverkeithny. In front of it is a granite cross 20 feet high, erected by the Tenantry in 1876 as a memorial to her husband, the late Alexander Morison, Esq. in pursuance of whose wishes this hospital was founded. Mansions are Auchaber, Aucharnie, Boyne's Mill, Cobairdy, Corse, Drumblair House, Drumblair Cottage Frendraught, Haddo, and Temple-land. 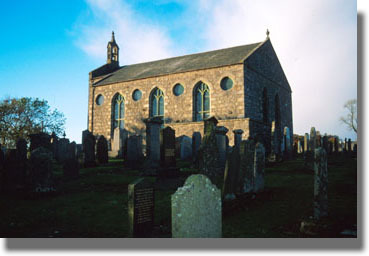 In the presbytery of Turriff and synod of Aberdeen, this parish includes the chief part of YTHAN-WELLS quoad sacra parish, itself being a living worth L311. Its church, erected in 1819, is a substantial edifice, with 900 sittings, Gothic windows, and a fine-toned organ, presented by Walter Scott, Esq. of Glendronach, in 1872. The same gentlemen presented a hall to the church in 1885. There are also a Free Church of Forgue, and an Episcopal church, St. Margaret's, which latter, rebuilt in 1857, ia an Early English structure, with nave, chancel, and a tower and spire 110 feet high. Forgue public, Largue public, and Forgue Episcopal school, with respective accomodation for 140, 140, and 61 children, have an average attendance of 101, 86, and 51, and grants of L92, 3s., L88, 15s., and l45, 2s. Population of civil parish (1801) 1768, (1831) 2286, (1861) 2686, (1871)) 2623, (1881) 2422, (1891) 2239; of ecclesiastical parish (1871) 1332, (1881) 13030, (1891) 1258. --Ord. Sur., sh. 86, 1876. 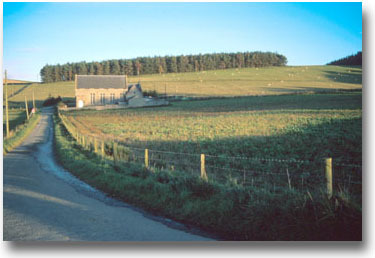 FORGUE, a parish, constituting a post office station of its own name, on the north western border of Aberdeenshire. Its is bounded by Banffshire, and by the parishes of Auchterless, Culsamond, Insch, Drumblade, and Huntly. Its length, south-eastward is about 9 miles; and its greatest breadth is about 6 miles. The Deveron traces part of the north-western boundary; the Ury traces part of the south-eaastern boundary; the Ythan rises in the interior, and runs away into Auchterless; and two burns, called Forgue and the Frendraught, drain the greatest part of the interior, become confluent, and fall into the Deveron. Thse two burns have a many romantic windings; and the former of them is beautifully skirted with wood. The general surface of the parish is a fine, undulating, pleasant alternation of vales and hillocks, holms and knolls. The north-western extremity is occupied by the hill of Foreman: which see. 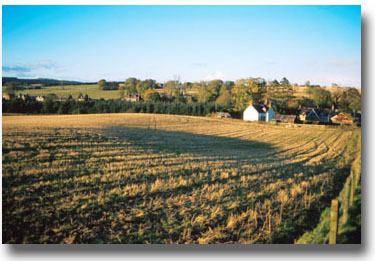 The other tracts near the Deveron, together with the central districts, display much amenity of feature and decoration. The south-eastern tracts, contiguous to the Ury, are mainly a series of bleak, cold moorish heights, called the hills of Foundland. The soil, in the lower districts, is generally a deep rich loam on a clay bottom, producing heavy crops. Towards the south, the ground is still partly in the state of nature, and covered with heath; but the proprietors having been sparing neither trouble nor expense in improving their several estates, in which they have been aided by the exertions of industrious and spirited farmers. Much of the waste grounds, incapable to be turned to any better account, have been covered with plantation. The most extensive landowners are Morison of Bognie, and Simpson of Cobairdy; and there are twelve others. The mansions are Frendraught, Cobairdy, Haddo, Auchaber, Corse, Drumblair, Boyne's Mill and Templeland. The situation, grounds, and historical associations of Frendraught --- or, as it is popularly called, Frennet --- possess much interest. There are still some remains of the old castle of Frendraught, the ancient seat of the Crichton family, between whom and the Gordons of Rothiemay arose in the early part of the 17th century, a feud which figures prominently in both song and story. The tower of the castle, at a moment when Vicount Aboyne, the laird of Rothiemay, and two or three of their followers were in it, was destroyed by a conflagration, so sudden and great as to prevent their escape; and a popular ballad alleges that they had been treacherously enticed to it by its lady with a view toward their destruction. Among the leaves that fa',"
there to find her victims, and entice them to the castle for their ruin. There are in the parish several Druidical temples and the vestigaes of an ancient encampment. The parish has an average distance of only about 7 miles from Huntly; and is traversed by the roads thence to Banff and to Aberdeen. There is a large distillery at Glendronach. There are in various parts six corn-mills. Fairs are held at Hawkhill on the third Tuesday of April, the last Thursday of May, and the third Tuesday of September, all old style. Population in 1831, 2286; in 1861, 2686. Houses, 536. Assessed property in 1843, L8,540. This parish is in the presbytery of Turiff, and the synod of Aberdeen. Patron, Morison of Bognie. Stipend, L191 6s. 5d; glebe L18. Unappropriated teinds, L406 13s 8d. There are two parochial schools, with salaries of L34 4s and 17L, together with emoluments. 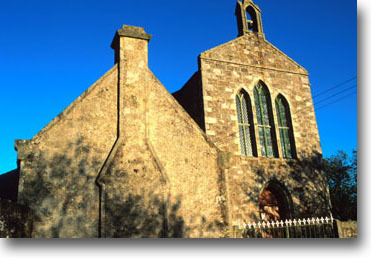 The parish church was built in 1819 and contains 814 sittings. There is a Free church: attendance, 630; sum raised in 1854, L202 7s. 11d. There is an Episcopalian chapel, which was built in 1795, and contains 230 sittings. 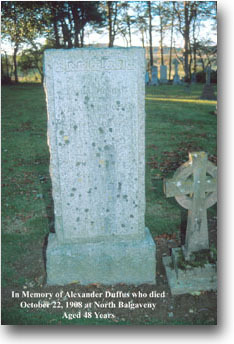 Grave of Alexander Duffus at Episcopalian chapel in Forgue. There was formerly a small Secession church at Bogfouton. Ther are 5 or 6 non-parochial schools and a savings bank. The ancient name of the parish was Forrig.